When I started out all spry and boisterous on this long winding journey of mine through Great War Cinema I hadn’t considered that there’d be a fair bit of Great War content that’d never hit a cinema screen. 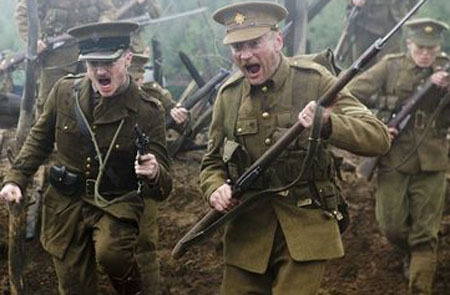 There have been some great TV documentaries over the years, such as the BBC series ‘The Great War’ from 1964 which is amazingly detailed in 26 three quarters of an hour episodes (It takes three episodes to get to the start of the war!) and World War One in Colour, which made celebrities of Harry Patch, Bill Stone and Arthur Halestrap. Also, although rarely, there have been TV series such as Anzacs and Blackadder Goes Forth. Fictional TV just doesn’t seem to be a media that has ever been that interested in the Great War. My review fodder today falls into the category of TV Movie, which maybe conjures up the image of a cheap, badly shot, shonky type of thing but in actual fact it’s a well put together piece of work I have in front of me. I remember watching this when it was originally shown on the BBC in the UK during 2007, it’s the story of Rudyard Kipling’s son John, and his desire to join the Army as the Great War rages on the other side of The Channel. It was originally a stage play written by David Haig who also starred as Kipling in both the stage play and the film version. The only other time I can think of him acting in something I’ve watched was alongside Rowan Atkinson in The Thin Blue Line. Can I quietly admit to liking The Thin Blue Line? Probably not. 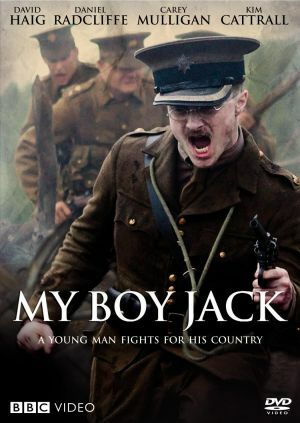 The story follows Kipling’s son John (known as Jack) as he firstly tries to get into the Army and then, after being rejected by them, the Navy. He keeps getting knocked back due to his terrible eyesight and as much as this is obviously a big deal for him it appears to be a much bigger deal for his Father. As a result of this it’s unclear if Jack really wants to go for his own reasons or if it’s the Pushy Parent nature of his Father that is leading his interest. Jack eventually gets a call up, after his Father persuaded the Army powers to give him a go with glasses on. 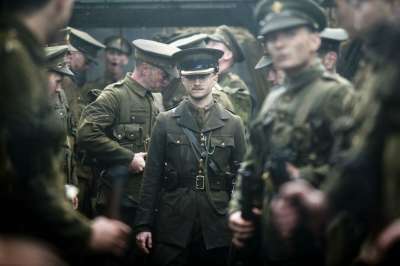 He makes it to The Front, dies in action and the rest of the film follows the family as they come to terms with his loss and try to piece together the events leading up to his death. The one big thing I took away from this film was the nature of the relationship between Kipling and his son. On the surface he appears an ideal Father. Engaging, loving, warm. But there is also a ‘Won’t take no for an answer’ side to his character and it’s this element of Kipling that causes the tension between Father and Son. The writers never allow it to develop within the confines of the story so the viewer is left to consider what impact it has upon them both. Is it the cause of Jack’s desire to run away to war? Following Jack’s death it becomes the crux of the second half of the story. Does Kipling carry the weight of his Son’s death on his shoulders? It’s not clear. His daughter points the finger of blame squarely in his direction when she hears of Jack’s death but Kipling appears to shrug this off. He must’ve felt the loss of his son keenly and his poem ‘My Boy Jack’ is, I suppose, a lament and also potentially an admittance of the guilt he must’ve felt. Within the film he appears to maintain his self-control for the good of the family and especially his wife as she struggles to come to terms with her son’s death. The film follows Jack’s journey into the front line and it does a good job of portraying trench life in all its splendour. It’s clear that Death is around every corner and we also see struggle to come to terms with leading a group of men who are his age or older. He leads by example and much as thousands of young, freshly moustachioed, Officers most likely did, he was the first over the top leading his men into the thick of battle. I quickly got over watching Harry Potter with a bad moustache and enjoyed his acting. Not that he had to stretch himself too far for this role. An upper middle class private schoolboy with pushy parents is probably something he can draw parallels to without too much trouble. David Haig plays Kipling very well and I really felt the love for his Son. Of course, having written the role and played in on stage he should’ve known it inside out. Jack’s story is a common one. A young man rushed to The Front to replace a dead predecessor. He’s there next to no time and dies within hours of his first foray over the top. The only reason this story is any different than the countless others is that he had a poem written about him by one of the most famous men of the era. The real hero of the piece is the Father/Son relationship and it works well. I could feel the love between them but also the tension as Jack fights for his opportunity at playing soldiers. This, in essence, is the story of Rudyard Kipling’s pushiness and how it ultimately caused the death of his son. The film ends with the poem. As a Father myself I struggle to make it all the way through the poem without a growing sense of dread forming in my chest. The dread that I should outlive either of my two gorgeous daughters. To have a child die is a tragedy, to cause that death and live on with the loss and the guilt must be almost impossible. I suppose in that way the real story here IS the poem. This film explains why the poem exists, it’s history and it’s DNA. It’s a good film, it’s easy to watch and the story has a natural pace. It’s classically shot and well put together. Double thumbs up from me for a portrayal of what is the sad reality of war across Europe, the missing generation of young men in the fields of Northern France and Belgium and the mourning families dealing with their losses at home. It’s on DVD if you fancy it. Clicky Clicky to grab yourself a copy.